Please Take Note: This is a review of the final game, but it might change slightly based on the success of the Kickstarter campaign. The game is being reviewed on the components and the rules provided with the understanding that “what you see is not what you might get” when the game is published. If you like what you read and want to learn more, we encourage you to visit the game publisher’s web page or visit the Kickstarter campaign. Now that we have all that disclaimer junk out of the way, on with the review. Jump on, strap in, and command your team of dragons LIKE A BOSS to win the race! Dragons were once feared, but they are now domesticated and adored. Some households even have dragons for pets. You and others breed, train, and race dragons. It’s the ultimate sport that brings man and dragon together to form a single team. You must trust your dragon completely as your dragon trusts you. This is a race where speed matters, but speed alone won’t win you the cup. You must think fast, think smart, and work with your dragon or you’ll be left far behind. Dragon Racer, designed by Myles O’Neill, Luke English, and to be published by Thylacine Games, will reportedly be comprised of 64 Dragon cards, 8 Trophy cards, 4 Character Cards, 12 Track Cards, and 8 Player tokens. As this is a review of a prepublished game, I will not comment on the game component quality. The illustrations by Rose “Rocky” Hammer are colorful, bright, and capture each dragon type marvelously. The Character and Track cards are double the size of the other cards in the game (which are standard size) and double-sided. Overall, the game’s proposed final offering is a real eye catcher with abundant color and fine detail. To set up the game, first separate the Track cards into three different piles: a Lower Track pile, an Upper Track pile, and a Corner Track pile. The Upper and Lower Track cards are easily identified by looking at the card’s back. Place the Corner Track cards to the side for a moment and give the Upper Track and Lower Track piles a good shuffle. When done shuffling, deal 3 cards to the table, face-down, from both piles. Place the remaining Upper Track and Lower Track cards in the game box, face-down. The removed cards should not be seen by the players. Second, place the Upper Track cards and the Lower track cards on the table, face-down, so they form 2 rows. The paths on the Track cards should connect. Third, place the Corner Track cards on the table, face-up, connecting to the two rows. Place the “Wyrm Wood” Corner Track in the upper left row, the “Burning Spire” Corner Track in the upper right row, the “Tempest Track” Corner Track in the lower right row, and the “Speed City” Corner Track card on the lower left row. When completed, your track will look like the following image. Fourth, have each player select a Character card. This can be done randomly or give each player the time to determine which racer is best for them. No single Character card gives a player an insurmountable advantage over another player. Character cards do list an Ability that is unique to the character, but how influential that ability will be within the game is determine by how well the player uses it. 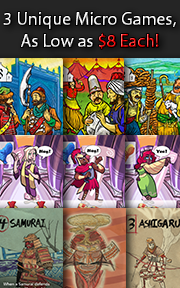 Character cards also provide the player with a handy quick reference to the game’s phases and bonus points. Fifth, after each player has selected a Character card, they should collect the Player token that matches their Character card color and place the token on the “Start” space located on the “Speed City” Corner Track card. Stack the tokens into a column. Sixth, take the Dragon cards and separate them into three different piles based on the card’s letter label (“A”, “B”, and “C” respectively). Depending on the number of players in the game, remove pile “C” or piles “B” and “C” from play. Removed cards are out for the duration of the game. Seventh, take the Dragon cards that are still in the game and separate them into different piles based on the card’s level number. Shuffle and place each pile face-up near the racetrack. These cards are collectively referred to as the “supply pile”. Take the “Level 1” Dragon card pile and deal 3 cards to each player. 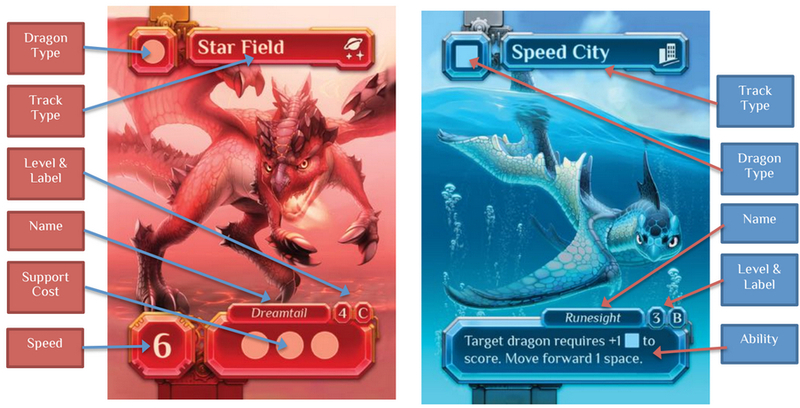 These cards represent the player’s starting dragon race team (also referred to as “team dragons”) and should remain face-up in front of the players. Any remaining “Level 1” cards are taken and shuffled into the “Level 2” Dragon card pile. Then place this pile of cards face-down to create the initial Dragon draw deck. Eighth, take the Trophy cards and set aside a number of Trophy cards equal to the number of players, starting with the Trophy card with the “1” on it. For example, if you were playing with 3 players, you would find and set aside Trophy cards with the number values “1”, “2”, and “3”. Any Trophy cards not used are out for the duration of the game. That’s it for game set up. Let’s race some dragons! Dragon Racer is played in turns, for a total of 7 turns per game. Each turn consists of several phases. A typical turn is summarized here. No, you aren’t going to repeat the game set up. This phase focuses on a few administrative tasks that need to be done to set the stage for the phases to come. All the Trophy cards are collected and redistributed based on the players’ positions on the racetrack. The player who is leading the dragon pack gets the “1” Trophy card, the players who is a close second gets the “2” Trophy card, and so on. If 1 or more players are ever sharing the same racetrack position with their Player tokens, determine what positions they share and then randomly deal those Trophy cards to those players. For the first turn in the game, the Player tokens are stacked on the “Start” space. Since the Player tokens are all located on one space, the Trophy cards are randomly dealt to the players. This is done in the same way as players tied in racetrack position later in the game. Flip over the next Track card (Upper or Lower), starting with the first Upper Track card and continuing around the track going clockwise. Corner Track cards are never flipped, but are skipped over. The only time you do NOT flip over a Track card is the first turn of the game. If a Player token is on the Track card, remember it’s location, flip the Track card, and then place the Player token back in its original position. When a new Track card is flipped, take the Dragon cards that match the Track card’s color/name from the supply pile and shuffle them into the Dragon draw deck. This phase focuses on giving each player an opportunity to build their dragon race team. In many respects, it’s the single most important phase of the game, as every phase that comes before and after it is based on the decisions made during this phase. Not surprisingly, it’s also the most involved and complicated phase of the game. Take the Dragon deck and give it a light shuffle (you shuffle cards a lot in this game). Deal out a number of cards to each player, face-down, equal to the turn number plus 2. For example, players will be dealt 3 cards during the first turn (turn 1 + 2 cards). The remaining cards in the Dragon draw deck are placed face-down next to the supply piles. Players should take a moment to review the cards they were dealt. Simultaneously, each player will now select 1 Dragon card from the hand they were dealt and place it face down in front of them. When all the players have selected their card, the remaining cards in their hand are passed, face-down, to the opponent to the player’s immediate left or right. The direction in which the cards are passed alternates per turn. Again, the hand of cards (now smaller than before) are reviewed and the player selects 1 card to keep, passing any remaining to their opponent. This continues until only 1 card is left in the hand, which is automatically kept by the player. This phase focuses on using the selected Dragon cards to score points. Points are tracked on the racetrack. The more points you score, the faster you fly around the racetrack. Each player can also use their Character card ability, but only once per turn! One at a time, and in reverse order of the Trophy card values (last player goes first), each player will play their drafted dragons to the table and assign them. Dragons can be assigned two different ways and can be swapped out to replace tired team dragons at the end of the phase. A dragon can support only one other dragon per turn, but a single dragon on the team can be supported by multiple dragons. Supporting Dragon cards are placed underneath one of the player’s team dragons in a column. Without the proper and full support of other dragons, a team dragon won’t move on the racetrack. Each Dragon card lists a Speed and Support Cost value. The Speed indicates how many spaces on the racetrack the Dragon card will move if fully supported. The Support Cost lists the type of support the dragon needs. Support types are identified by their shape and color. Dragons provide a specific shape and color, as does the Character card. Using these, the player is essentially “fueling” the dragon to race around the track. Once the Support Cost is paid, the dragon will roar around the track, both literally and figuratively speaking. It’s worth noting that a dragon can be overly supported, but doing so provides no benefit. If a dragon is not supported enough to meet the Support Cost, it’s the same as not being supported at all. Dragons can be used to support the racing dragons by paying for their Support Cost, but this only works if the dragon provides the required support type. If it doesn’t, the Dragon card might still be of use if it has an Ability. Abilities mess up the race a bit and can give the player a slight advantage over their opponents. If playing a Dragon card for its Ability, simply place if face-down, read the Ability, and resolve it. 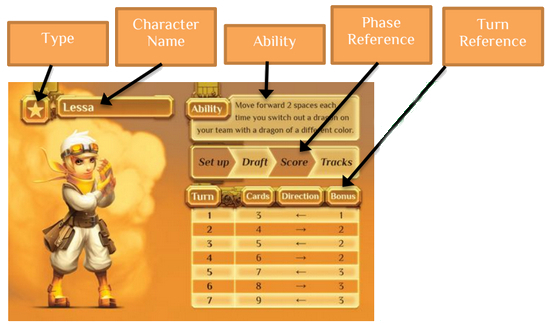 If the player needs to select a dragon or an opponent, they do so while resolving the Ability. From the Dragon cards the player drafted, they have the option of selecting 1 and replacing it with a team dragon card they have in front of them. Swapping is always a 1-to-1 exchange and is always done as the last action by the player during this phase. This puts the player in something of a pickle as they must decide if they want to swap out an older dragon for an improved dragon or use the improved dragon’s abilities for support to help the older dragon around the track. When swapped out, the new dragon joins the ranks of the dragon team and the replaced dragon goes into the player’s hand. After the player has played the cards from their drafted hand, they move their Player token a number of spaces equal to the total speed of the fully supported team dragons, including any additional spaces provided by Abilities. Any cards still in their hand remain in their hand until all players have completed playing cards. The next player in turn order sequence now goes. After all the players have moved their Player tokens (if they were able to fully support their dragons) and resolve any Abilities, it’s time to review the racetrack to determine if any bonus points are awarded and clean everything up for the next turn. These bonus points are awarded to the player who managed to collect the most Dragon cards for each Track type. There are 6 Track types in total (Speed City, Wyrm Woods, Burning Spire, Tempest Track, Golden Caves, and Star Field). To determine which player wins the bonus, everyone takes a quick count of the Dragon cards they currently have for their dragon team and any Dragon cards they played this turn. The player who wins the bonus moves their Player token a number of spaces forward on the racetrack for free. The number of spaces moved is dependent on the current turn number. If the card count reveals that 2 or more players tied for most Dragon cards for each Track type, the tied players only get to move ahead 1 space each regardless of the bonus value. Finally, if none of the players have any Dragon cards from a Track type, then no bonus movement is awarded. Once the bonus points are awarded (if any), place all played Dragon cards and any Dragon cards in the player’s hands and add them to the Dragon draw deck, including any cards that were not dealt out. The player’s dragon team remains. The Dragon draw deck is shuffled and placed face-down, ready for the next turn. This completes a single turn in the game. The next turn begins with phase 1. The race (and game) comes to an end when the 7th turn has been completed. The player who has gone the furthest wins the game. Note that the winner of the race is not determined by who finishes the lap first, but who can go the greatest distance within 7 turns. If a player should complete a lap, they and their dragon team continue to race around the track until the game ends. When playing with only 2 players, do not use the “Red” and “Blue” Character cards. Dragon Racer is designed to seat up to 4 players. If 2 copies of the game are available, Dragon Racer can seat up to 8 players. Simply combine the Dragon cards from both games and separate them into different piles by their letter label. Then you remove one or more piles based on the number of players in the game. To learn more about Dragon Racer, visit the game publisher’s web page or visit the Kickstarter campaign. The Child Geeks, thanks to a number of smaller and easier card drafting games, quickly understood what was expected of them and launched right into the race. The only aspect of the game they had trouble with at first was selecting cards that worked well. Which is to say, the first and second turns were a poor showing of their dragon’s speed. But they quickly caught on and so, too, did their dragons. Within no time, they were racing around the track. According to one Child Geek, “I really like this game! I feel like I am adding boosts to my dragon cars!” Ha! Dragon cars. Precious. Another Child Geek said, “The part of this game I don’t like is not being able to keep my cards from the last turn. I bet my dragon would fly!” I’m sure it would! When the races were over, the Child Geeks gave Dragon Racer first prize. 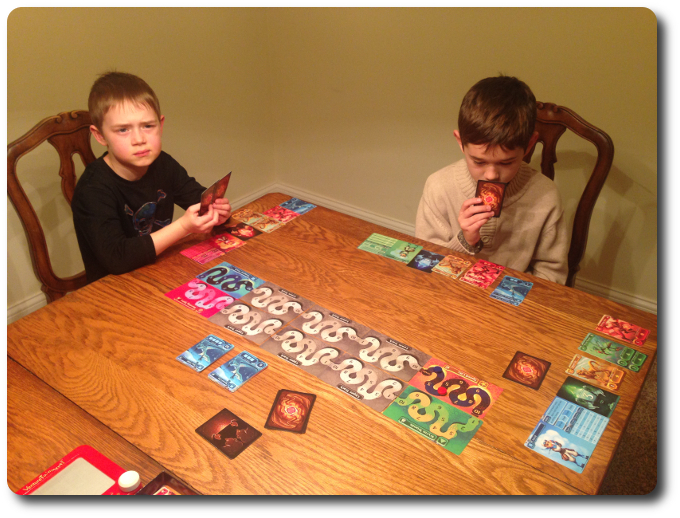 The Parent Geeks, who are used to card drafting game like 7 Wonders, found Dragon Racer to be casual and challenging, without feeling heavy or overly fiddly. According to one Parent Geek, “I was concerned at first that we would be focusing too much on the racing, but I see now that the racetrack is really nothing more than a score tracker.” Another Parent Geek said, “I think the theme of the game is going to play really well with the fantasy crowd, but will keep others away. Which is a real shame, because this is a fun game.” The non-gamers were a bit slower to warm up to Dragon Racer, but they also found the game to be fun (if not slightly silly with all the dragon nonsense). When the dragons were retired, the Parent Geeks applauded their performance, giving Dragon Racer their approval. The Gamer Geeks, who are the most elite of gamers (in their own heads, at any rate), initially dismissed Dragon Racer. According to one Gamer Geek, “The artwork on this is way to cutesy for me. I can feel my teeth hurting from the sweetness.” Once we broke down that barrier, the Gamer Geeks found Dragon Racer to be a casual, but most certainly competitive, card game. One Gamer Geek said, “This is a bit lighter than I like, but I’d play this again. It’s got just the right mix of strategy and tactics, giving me enough to think about each turn to keep me engaged.” Another Gamer Geek said, “Neat ideas in this game. Some I’ve seen before and some are brand new. I like that. I also like how easy the game plays out. Very smooth. Yeah, this is a good game.” The Gamer Geeks were not altogether happy with the illustrations, wanting something “darker” with more fire and grit, but all of them agreed that the game was worth their time and entertaining. Dragon Racer is not yet published, so many of its little quirks can be forgiven if we consider that the game designer has already stated that some refinement and tightening is in order. The most obvious place to start is the rules. I am still not 100% certain if we played the game correctly, due to the rules being ambiguous or flat-out misleading due to wording. Still, what we played was found to be fun by all. I look forward to seeing the final rules to determine how close to the mark we were. I have no doubt that we collectively misunderstood the Track bonus phase, for example. I found the most interesting aspect of the game to be the racetrack which is little more than a creative way of keeping track of a players’ scores. Thematically, the racetrack works great and revealing each Track card not only counts down the turns, but opens up the game for more Track bonus points. But it also does something very important for the game play. By giving the players a racetrack instead of just a scoreboard, it drives the player on, leads them to take risks to jump ahead, and push through. Scoreboards only let you know how many points you have. Dragon Racer’s racetrack tells you how much faster you need to drive your dragons to win. Less interesting, but no less entertaining, is the card drafting. I found it limiting at first to only be given 3 dragons for my team, but soon found that any limitations I might see could be reduced or fully removed by good card plays. Drafting Dragon cards for support, abilities, and replacement makes you really think about each card you select. There were many times that I felt a tremendous amount of excellent frustration as I had to pick between 2 or more cards that were “perfect” for what I wanted to do. Not a single card I had available to me was bad, which is a very good thing, but it feels horrible to not be able to take them all! When all the cards are selected, it’s time to show your hand! For me, this was the “Ah-Ha!” moment of the game. Did I build my dragon team right? Did my opponents outwit me? Was I incorrect t to think that an Ability this round was better than a boost of speed? All these answers are given, leaving you with a tremendous amount of pride or a seething feeling of bitterness towards your dragons. As you jump ahead with your Player token and then get overtaken and passed by your opponents, you can’t help but give them the mental middle finger. Which I’m sure many Parent and Gamer Geeks did…. The racetrack also gives players an opportunity to pause and consider how they want to build their team’s strategy and tactics for each turn. For example, I was ahead of the other racers, but decided to hold back so I could upgrade my dragons for the next leg of the race. Being behind is not necessarily a bad thing. When you are up front, what decisions you can make are very limited, usually focusing only on speed. If you are in the back, you have a lot to consider. Jumping forward and back was a lot of fun and provided players opportunities to come at the game different ways. The only aspect of the game that was under utilized was the Track bonus. Not many players focused their time or attention on these points. They instead focused on simply moving their dragon forward and tripping up their opponents. As the game turns progressed, the bonus points to be won increased, which I assumed would serve as the proverbial “carrot”, leading players to seek out the bonus points. But I was wrong. The primary focus was always on moving as far and as fast as one could, not collecting specific cards. Again, I think this might be due in part to how we interpreted the Track bonus rules. The published game should hopefully go into more detail about this portion of the game. Time to decide! Is this a game worth looking into? Should it occupy your gaming table, shelf, and time? All our groups believed so and I am inclined to agree. I am not a fan of many card drafting games as card drafting often feels like a gimmick. In the case of Dragon Racer, it gives players an opportunity to build the dragon team they want without being stuck with a single hand of cards. But like a real race, players must think fast, be sure of their decisions, and move forward. This is a challenging game, but plays casually. There is no such thing as a bad hand and it’s up to the players to do something with it. No luck here. Only skill. Games like this always entertain me and they certainly entertained others. 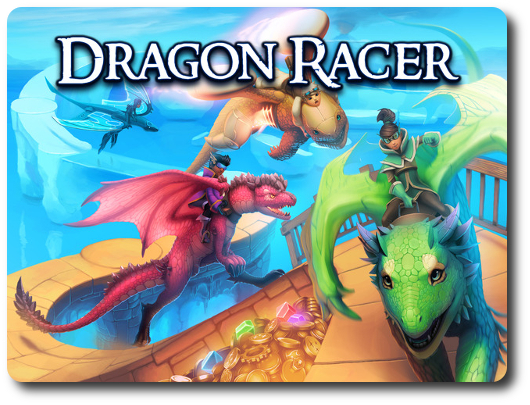 Do take a look at Dragon Racer to see if this race game is the one you’ve been looking for. 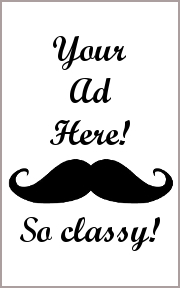 Tagged Card Games, Child Geek Approved, Fantasy Games, Father Geek Approved, Gamer Geek Approved, Parent Geek Approved, Prepublished Games, Racing Games. Bookmark the permalink.